The story begins with Mike Jones, the protagonist, receiving a telepathic message from Mica, the princess of the Argonians, whom Mike had rescued in the previous game. She tells Mike how to solve a cipher that he and his uncle, referred to as Dr. J, found on the side of the Argonians’ space pod. Mike goes to see Dr. J, and together, they solve the cipher and read it aloud. This causes Mike to be flung into the past. He arrives in the Stone Age. After helping a tribe of cave men retrieve their children from a flesh-eating wild boar, he finds an object, which Mica telepathically identifies as a Tetrad ("Block" in the Virtual Console version). He must travel to different eras throughout Earth’s history and retrieve the rest of the Tetrads. 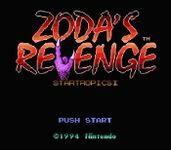 During one time jump, in which Mike helps Sherlock Holmes prevent a robbery at the museum, he discovers that Zoda, the antagonist of the previous game, is alive in Holmes’ time period, and is also trying to collect the Tetrads. Mike defeats Zoda again and claims the Tetrad that Zoda tried to steal. Based on the fact that Zoda referred to himself as Zoda-X, Holmes deduces that there are likely to be a Zoda-Y and Zoda-Z somewhere in time, as well. This is proven to be true, as Mike later faces and defeats Zoda-Y in Transylvania. After he recovers the last of the Tetrads, Mica contacts Mike and tells him that Zoda-Z has attacked C-Island, where the Argonians are staying. Mike returns to the present and faces Zoda-Z in combat. After finally defeating Zoda, the Chief of C-Island helps Mike put the Tetrads together. When they are together, Hirocon, the leader of the Argonians and Mica’s father, appears from the tetrads. He leads the Argonians back to their home planet to rebuild. Source: Wikipedia, http://en.wikipedia.org/wiki/StarTropics_II, available under the CC-BY-SA License.